Choosing the right kitchen countertop is a big decision. In fact, it is considered as an investment. Countertops are an essential part of your home and are going to be there for a long time. Choosing the right countertop for your kitchen will have an impact on the value of your home, should you decide to put on the market one day. Buying a kitchen countertop can be somewhat of an investment, but that does not necessarily mean the choice has to be difficult. The experts at The Showroom Interior Solutions are available to guide and advise you to ensure you get the right countertop for your kitchen and for your taste. 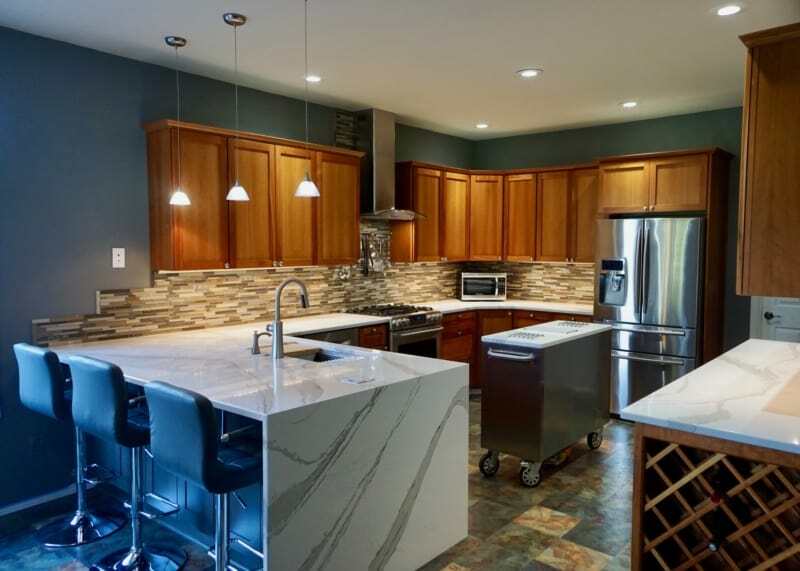 We will ensure that you develop a good understanding of the various kitchen and bathroom countertop materials., as we have already done for numerous homeowners from Olympia, Lacey, Tumwater, Yelm, Thurston County and surrounding areas. Please contact us, or stop by our beautiful showroom, so that we may start a conversation that will result in a countertop you will be proud and happy to have in your kitchen. This will ensure you make the right choice, while taking the pain out of the selection process. As it always helps to be informed before undertaking any project, we have compile some useful information about countertops below. Solid surfaces are generally made out of highly stain and scratch resistant materials, such as acrylic and/or polyester. These materials are completely renewable, reparable and highly customizable. In terms of design these materials allow for endless options in terms of shape, colors, and patterns that can even give the illusion of natural stone resemblance. Solid surfaces have been around for almost 40 years and technological improvements produce a quality that is highly regarded in terms of withstanding kitchen activities, while capturing your personal esthetic. An increasingly popular solid surface material is quartz. Though relatively new, quartz countertops have become very popular among homeowners who are looking for a modern look and feel. Quartz is an engineered stone and unique solid-surfacing material made out of about 90% quartz and 10% acrylic or epoxy binder. Being far from the traditional solid-surfacing materials, quartz is considered much harder and has more depth, clarity, and radiance. It is also available in a variety of colors and patterns. Furthermore, quartz is practically maintenance-free. It is also resistant to scratch, stain, impact, and heat, making it the perfect material for kitchen countertops. Its surface is non-porous, so it doesn’t require any sealing, unlike natural stone countertops. If you are looking for the quality and style of quartz countertops, stop by The Showroom Interior Solutions and we will take you through our wide range of options. You will most certainly find a countertop that matches your style. Natural stone countertops are sought after for their beauty. The most famous for their natural beauty. We’ve outlined the most popular natural stone choices below. Among the different types of natural stone, granite has been the popular choice among homeowners who want a countertop that combines a high-end look with natural beauty. Moreover, no two natural stone countertops look the same, ensuring a unique look. Granite comes a wide array of colors and natural patterns. However, due to its uniqueness, granite can be tricky to match up; most especially since it is usually cut into long, thick slabs. As it is natural, it also requires constant sealing to maintain the look. When choosing this as a kitchen countertop material, you have to make sure that you are prepared to take on the required level of care and maintenance. If you are on the market for a granite countertop, visit The Showroom Interior Solutions and we will guide you through all aspects of making such a choice. Other kinds of natural stones are marble, limestone, and soapstone. Marble and limestone are classic and elegant materials that are best if you don’t want any heavy veining or graining. Like soapstone, they are also very heat resistant. However, these three materials require more care than granite. They need to be sealed very often. As such, there’s a lot to consider when choosing this as a kitchen countertop material. Wood surfaces have become less prominent over the years following the rise in popularity of granite and engineered stone. If you are looking for a more traditional countertop the inclusion of a butcher’s block as part of your countertop layout may be an option to consider. A butcher’s block is more suited to country and cottage-style kitchens. It is much preferred for its warm and natural appearance. However, as with its nature, scratches from knives and other sharp objects can leave a mark. So it helps to occasionally sand them out. Furthermore, as with the wood material, butcher’s blocks swell and contract when exposed to moisture, so it is of paramount importance to ensure it is well oiled and varnished. Regardless of the type of countertop you are interested in, The Showroom Interior Solutions has such a wide range of materials, patterns and colors that you are pretty much guaranteed to find what you are looking for among our collections. Stop by and look at our samples while one of our experts answers your questions and helps you find the right countertop for you. We look forward to welcome you in our showroom!